I am a family doctor. I love to see families: babies, kids, mothers, fathers, and grandparents. I speak White Hmong and so most of my patients are Hmong. I am Medical Director of Quality and am committed to improving medical care at West Side. I am Co-Director of Community-based Research and a member of our community-based participatory action research group called SoLaHmo Partnership for Health and Wellness. 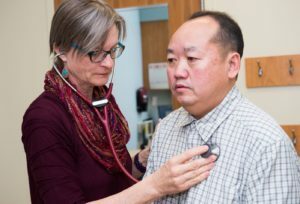 I have worked with multi-cultural communities as a family physician, as a researcher, and as an anthropologist in Saint Paul since 1983 and in Thailand since 1989. I am co-editor of a book about cultural competent care in the Hmong community called Healing by Heart: Clinical and Ethical Case Stories of Hmong Families and Western Clinicians. I am married to Tim and have two children: Sam and Megan.